Vernacularisms is my home for a series of notes containing ‘literary snapshots’ of everyday, ‘vernacular’ life in Belfast and the North of Ireland. Although the notes are specific to the places I write about, using street names and dialect words that may be alien to many who live further afield, they are nonetheless intended to appeal to a wider audience. When I write about the Ormeau Park, for example, I would like my readers to be able to visualise the same event happening in their locality, be it Central Park or Yoyogi Park. In most of the notes I reference a certain ‘universality’ of human experience that I hope will be recognisable wherever the reader comes from. I keep the notes short, avoiding lengthy descriptions where I feel that providing too much detail would undermine this universal appeal. My writing style therefore leans towards the poetic in the choice of words and the punctuation used; the notes have to ‘punch above their weight’ by telling the story succinctly. The prose requires a similar depth of reading as would be brought to a poem. Although many of the stories have their roots in real events, I would like to make it clear that they are works of fiction: names, dates and locations have been changed where necessary. I am not writing about YOU. I use different narratorial voices, which are sometimes unreliable, and I also experiment with different genres of writing. There are now audio clips (in .wav format) of readings for some stories; I shall be uploading more over the coming months. To listen or download, just click on the link at the bottom of the text. You can find out more about the readers and guest contributors on the ‘Readers‘ page. To maintain the universal appeal, I have generally avoided using pictures of the various locations I mention in the blog, alongside the text. You can also visit the blog’s Facebook page, and my Pinterest page, where I post pictures of the places in the stories. There is a link to the Facebook page at the very bottom of this screen. A link to the Pinterest page can also be found on the side menu. The photographs on this page are from the 19th Century brick wall of H J Martin at the bottom of Rugby Avenue, just off the Lower Ormeau Road. I used to walk up there every day on my way to Queen’s University. 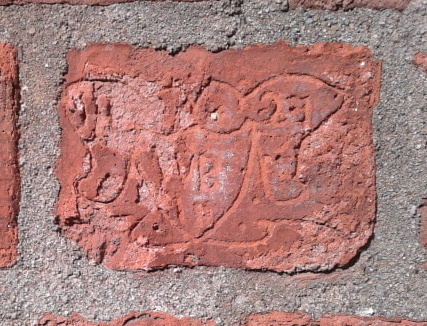 I had been doing so for years and had not noticed anything unusual, until one morning the combination of winter sunlight and rain on the wall revealed a patch where some twenty or so people had carved their initials and names quite elaborately into the bricks. I suspect they were the builders who had put up the wall. Unfortunately when H J Martin sold off part of their yard for a housing development, this stretch of wall was was pulled down. I didn’t get a picture of it. Only five carvings remain now. I hope you enjoy my observations; please feel free to leave a comment, rate, or share the post. You can also follow the blog to get an email whenever I publish a new post. Posts are listed in the menu on the right of the page, and older material can be found in the archives, also on the right. All content and images on all pages of this blog © 2014 Jason O’Rourke, or guest contributors, unless specifically stated. All Rights Reserved. hi Sandra, thanks for getting in touch. Can you leave me some contact details? Hi Sandra, did you get my reply? I’m a fan of your writing after reading only the latest couple of entries on your blog, Jason. You have a wonderful “voice”, and it will be a delight to be able to read you in the future. Thank you for visiting my blog and taking the time to comment. Thanks! I was at QUB as well. Will be over to your blog directly. I forgotten to say … congratulation to the Freshly Pressed. Thanks very much. I’m delighted! I lived in your fantastic city for 10 years … and I still call it mine. I visit Belfast every year. Enjoyed every day of my time in the city … fantastic people … great years. Thanks! You might have heard me play in one of the trad sessions…? Great city alright. Great city, great people and great food. I think I must come back and read all your posts. So glad that I ran across your blog! Congratulations on being Freshly Pressed! Thanks ever so much; I hope you enjoy the rest of the blog..
What a great ‘about’ – & you write well. Ah Belfast, I have only heard it on the news & seen it in the movies. I actually love to see photos in blogs of where people are mentioning & alas alas I have neither Pinterest nor FB. But yes, I can always google a peek at where you’re speaking of. It’ll be great to come by every now & then & read of your part of the world – not a movie, not a news item. Thanks! Glad you like it, looking forward to spending some more time on your blog as well. I used to live in 331 Ormeau Road – I loved the graffiti and weird sayings of my father’s home city – look forward to reading your blog. You must be enjoying the pics on my Pinterest page – there are few from outside your old front door! It’s changed a wee bit round there now though. Love this wee story Jason. Thanks, Eilish. I was up Rugby Avenue today, and found a new name carved in to the wall. It’s amazing how you can only see then when the light is right. Pictures on the Facebook Page and Pinterest page soon.